Turn on, tune in, and chill out with this must-have journal! Tap into your strengths, gain insights into your thoughts, and build confidence in the person you've already become with this keepsake journal created especially for girls. You'll discover new ways to digitally detox and become more mindful as you fill in the beautiful pages of this book. Every day, you'll be prompted to fill in the blanks that tell your story—and get you in touch with your truest self. What's your perfect start to the day? What is your favorite hobby? How do you like to relax? What goals would you like to achieve? Dream, plan, and track who you are right now—and shape the person you hope to be in the future. Inspirational quotes, practical tips, and interesting hacks will make this book a joy to open, and a treasure trove of information to look back on in the coming years. 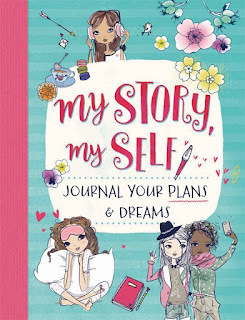 This was a great book that really leads the reader through many prompts that will give you ways to capture things about yourself that you can then remember for all time. My daughter loved going through the different activities and saw this as a keepsake that she can continue to look back at in years to come. This was a very fun book that will let your own child explore so much about themselves!